Home » 5 Freshest » Black Forest Organic Sour Heads. Let’s Call them Stars. 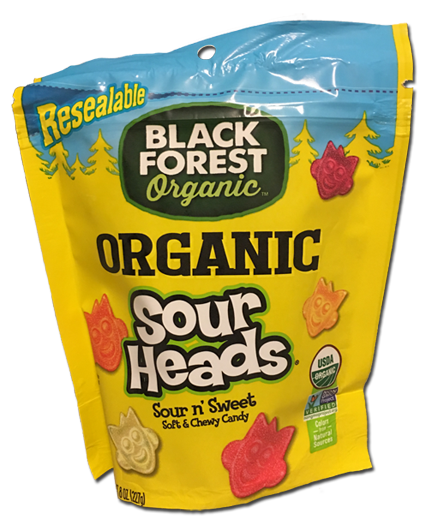 I thought these Black Forest Organic Sour Heads may have been related to Lemon heads. Not only do they use the word “heads” in the name but the font is similar. Am I wrong here? But whether or not Black Forest has the OK on the font and name is neither here nor there. What you and I care about are the goods themselves. The taste starts out strong. Although the flavors aren’t very varied (raspberry, lime, fruit punch, lemon, and orange), nor are the colors, they’re good. 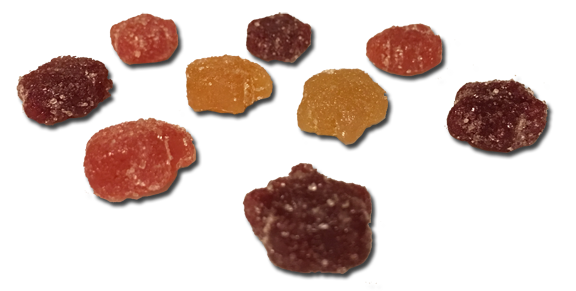 Made with organic cane sugar and carrot juice amongst other things, they have that genuine flavor that good organic candies have. IE, they taste real. The’ve got some zing too. Wouldn’t call them super sour, but more than tart. They are kinda sticky though, means you need something to wipe your hands on after you eat. I didn’t love that, nor the partly sugar (maybe sour sugar) coating. Also, they don’t look like heads, they look like stars people! Still, as a USDA Certified Organic, project non-GMO verified and gluten-free candy, I’ll take. These are a pretty good confection, and an extra star when you want something a tad more world-positive.